Accountability — we all want the people around us to be responsible, reveal genuine commitment, keep their word, and stay away from blaming others. But organizational systems that aim to institutionalize accountability don’t quite go all the way. People are people. They have their own wants and needs, their own psychological tangles, and they often don’t particularly want to be held accountable, let alone confront others who have let them down. 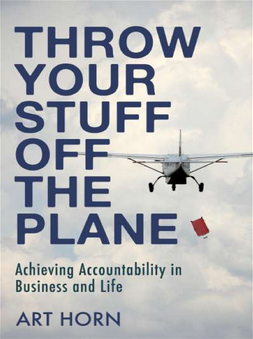 Throw Your Stuff Off the Plane is here to help. It reveals the missing ingredient in the traditional recipes to get people to do what they are supposed to do. It provides a step-by-step process for inspiring team members to embrace more personal responsibility, necessary to consistently deliver results.